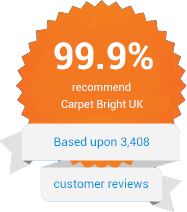 Carpet Bright UK is an award-winning carpet cleaning company. Our carpet cleaning machines can recover up to 98% of the water used in the cleaning process: this compares with 40% removal from smaller portable units. Over the years we have cleaned thousands of carpets and upholstery for customers in the South East of England. We have been voted the best carpet cleaner in Bromley & Croydon by our clients. All Carpet Bright UK's technicians are fully certified in carpet, upholstery and fabric cleaning. This ensures that your technician will be able to deliver your cleaning needs to the highest possible standard. We can access properties up to the 5th storey and our costs include stain removal and deodorisation. All dust mites and residual odours are pumped away and not left to circulate around your home, effectively preventing a host of health problems. If we see a cleaning issue we feel we cannot resolve, we will inform you before commencing work. Carpet Bright UK has currently performed over 10,000 cleaning jobs for our residential and commercial clients.